A typically devilish Baptist church “Pattaya-Jomtien Baptist Conference Center Church”, in Pattaya, Thailand, covertly banished an innocent Christian from fellowship because the innocent Christian is a real Christian. The unwelcomed, banished and persecuted Christian person Torsten is absolutely innocent in relation to each banishment by all churches worldwide, is absolutely innocent in relation to the unwelcoming and persecuting churches in Thailand, and is absolutely innocent also to this particular devilish Baptist church in Thailand. This typically devilish Baptist church indirectly acknowledged through their covert ban against innocent Torsten that facts, evidence, truth, justice, love, Biblical praxis and God are irrelevant. The typically devilish Baptist church “Baptist Conference Center Church” in Pattaya, Thailand, covertly banished a Christian who is absolutely innocent in relation to this particular devilish church, and who is absolutely innocent in relation all the other thousands of satanic churches worldwide who also have excommunicated / banished / evicted / assaulted / slandered / lied / persecuted the same innocent Christian. Similar to other churches in Thailand, and comparable to other satanic pastors and devilish priests of churches globally who have refused to welcome the innocent Christian person Torsten, also this typically devilish Baptist church decided to covertly banish Torsten. When innocent Torsten repeatedly contacted this typically devilish Baptist church in Thailand by email and via a visit to the church office, inquiring of opportunity to fellowship, the typically devilish Baptist pastors refused to welcome Torsten to fellowship, in effect as a covert banishment. Why do all of satan's Baptists worldwide banish and persecute innocent Torsten? (1) International Missions Board (IMB), of Baptists. (2) Thailand Baptist Missionary Fellowship (TBMF), of Baptists. (3) Thailand Baptist Convention (TBC), of Baptists. Because all Baptist churches worldwide, as far as I am aware, have banished me from their churches, and because none of the Baptists in Thailand welcome me to their Baptist churches either, it is difficult to not interpret your refusal to welcome me as; that all Baptist churches also in Thailand have decided to covertly banish me. QUESTIONS: Why have your Baptist churches in Thailand covertly banished me? What specific sin, immorality or wrongdoing do your Baptist churches in Thailand accuse against me, justifying your Baptists’ covert excommunication/banishment? Why do satan's Baptists worldwide always persecutes the innocent Christian Torsten? Why satan's Baptists worldwide always persecutes the innocent Christian Torsten? Fwd: Fwd: Fwd: Fwd: Fwd: Fwd: Fwd: Fwd: Fwd: Fwd: Fwd: Fwd: Fwd: Fwd: Re: Fwd: Fwd: Fwd: Fwd: Fwd: Fwd: Fwd: Fwd: Fwd: Fwd: Fwd: Fwd: Fwd: Fwd: Fwd: Fwd: Fwd: Fwd: Fwd: Fwd: Fwd: Fwd: Fwd: Fwd: Fwd: Fwd: Fwd: Fwd: Fwd: Christian relationships. Fwd: Fwd: Fwd: Fwd: Fwd: Fwd: Fwd: Fwd: Fwd: Fwd: Fwd: Fwd: Fwd: Re: Fwd: Fwd: Fwd: Fwd: Fwd: Fwd: Fwd: Fwd: Fwd: Fwd: Fwd: Fwd: Fwd: Fwd: Fwd: Fwd: Fwd: Fwd: Fwd: Fwd: Fwd: Fwd: Fwd: Fwd: Fwd: Fwd: Fwd: Fwd: Fwd: Christian relationships. Fwd: Fwd: Fwd: Fwd: Fwd: Fwd: Fwd: Fwd: Fwd: Fwd: Fwd: Fwd: Re: Fwd: Fwd: Fwd: Fwd: Fwd: Fwd: Fwd: Fwd: Fwd: Fwd: Fwd: Fwd: Fwd: Fwd: Fwd: Fwd: Fwd: Fwd: Fwd: Fwd: Fwd: Fwd: Fwd: Fwd: Fwd: Fwd: Fwd: Fwd: Fwd: Christian relationships. Fwd: Fwd: Fwd: Fwd: Fwd: Fwd: Fwd: Fwd: Fwd: Fwd: Fwd: Re: Fwd: Fwd: Fwd: Fwd: Fwd: Fwd: Fwd: Fwd: Fwd: Fwd: Fwd: Fwd: Fwd: Fwd: Fwd: Fwd: Fwd: Fwd: Fwd: Fwd: Fwd: Fwd: Fwd: Fwd: Fwd: Fwd: Fwd: Fwd: Fwd: Christian relationships. Fwd: Fwd: Fwd: Fwd: Fwd: Fwd: Fwd: Fwd: Fwd: Fwd: Re: Fwd: Fwd: Fwd: Fwd: Fwd: Fwd: Fwd: Fwd: Fwd: Fwd: Fwd: Fwd: Fwd: Fwd: Fwd: Fwd: Fwd: Fwd: Fwd: Fwd: Fwd: Fwd: Fwd: Fwd: Fwd: Fwd: Fwd: Fwd: Fwd: Christian relationships. Fwd: Fwd: Fwd: Fwd: Fwd: Fwd: Fwd: Fwd: Fwd: Re: Fwd: Fwd: Fwd: Fwd: Fwd: Fwd: Fwd: Fwd: Fwd: Fwd: Fwd: Fwd: Fwd: Fwd: Fwd: Fwd: Fwd: Fwd: Fwd: Fwd: Fwd: Fwd: Fwd: Fwd: Fwd: Fwd: Fwd: Fwd: Fwd: Christian relationships. Fwd: Fwd: Fwd: Fwd: Fwd: Fwd: Fwd: Fwd: Re: Fwd: Fwd: Fwd: Fwd: Fwd: Fwd: Fwd: Fwd: Fwd: Fwd: Fwd: Fwd: Fwd: Fwd: Fwd: Fwd: Fwd: Fwd: Fwd: Fwd: Fwd: Fwd: Fwd: Fwd: Fwd: Fwd: Fwd: Fwd: Fwd: Christian relationships. Fwd: Fwd: Fwd: Fwd: Fwd: Fwd: Fwd: Re: Fwd: Fwd: Fwd: Fwd: Fwd: Fwd: Fwd: Fwd: Fwd: Fwd: Fwd: Fwd: Fwd: Fwd: Fwd: Fwd: Fwd: Fwd: Fwd: Fwd: Fwd: Fwd: Fwd: Fwd: Fwd: Fwd: Fwd: Fwd: Fwd: Christian relationships. Fwd: Fwd: Fwd: Fwd: Fwd: Fwd: Re: Fwd: Fwd: Fwd: Fwd: Fwd: Fwd: Fwd: Fwd: Fwd: Fwd: Fwd: Fwd: Fwd: Fwd: Fwd: Fwd: Fwd: Fwd: Fwd: Fwd: Fwd: Fwd: Fwd: Fwd: Fwd: Fwd: Fwd: Fwd: Fwd: Christian relationships. Fwd: Fwd: Fwd: Fwd: Fwd: Re: Fwd: Fwd: Fwd: Fwd: Fwd: Fwd: Fwd: Fwd: Fwd: Fwd: Fwd: Fwd: Fwd: Fwd: Fwd: Fwd: Fwd: Fwd: Fwd: Fwd: Fwd: Fwd: Fwd: Fwd: Fwd: Fwd: Fwd: Fwd: Fwd: Christian relationships. Fwd: Fwd: Fwd: Fwd: Re: Fwd: Fwd: Fwd: Fwd: Fwd: Fwd: Fwd: Fwd: Fwd: Fwd: Fwd: Fwd: Fwd: Fwd: Fwd: Fwd: Fwd: Fwd: Fwd: Fwd: Fwd: Fwd: Fwd: Fwd: Fwd: Fwd: Fwd: Fwd: Fwd: Christian relationships. Fwd: Fwd: Fwd: Re: Fwd: Fwd: Fwd: Fwd: Fwd: Fwd: Fwd: Fwd: Fwd: Fwd: Fwd: Fwd: Fwd: Fwd: Fwd: Fwd: Fwd: Fwd: Fwd: Fwd: Fwd: Fwd: Fwd: Fwd: Fwd: Fwd: Fwd: Fwd: Fwd: Christian relationships. Pattaya/Jomtien Baptist Conference Centre Church. Fwd: Fwd: Re: Fwd: Fwd: Fwd: Fwd: Fwd: Fwd: Fwd: Fwd: Fwd: Fwd: Fwd: Fwd: Fwd: Fwd: Fwd: Fwd: Fwd: Fwd: Fwd: Fwd: Fwd: Fwd: Fwd: Fwd: Fwd: Fwd: Fwd: Fwd: Fwd: Christian relationships. The email address which you attributed to your pastor, named Archan Sang, is not valid. "<wisatkut_19@hotmail.com> failed: hotmail.com: 550 5.5.0 Requested action not taken: mailbox unavailable. [CY1NAM02FT011.eop-nam02.prod.protection.outlook.com]"
Fwd: Re: Fwd: Fwd: Fwd: Fwd: Fwd: Fwd: Fwd: Fwd: Fwd: Fwd: Fwd: Fwd: Fwd: Fwd: Fwd: Fwd: Fwd: Fwd: Fwd: Fwd: Fwd: Fwd: Fwd: Fwd: Fwd: Fwd: Fwd: Fwd: Fwd: Christian relationships. Re: Fwd: Fwd: Fwd: Fwd: Fwd: Fwd: Fwd: Fwd: Fwd: Fwd: Fwd: Fwd: Fwd: Fwd: Fwd: Fwd: Fwd: Fwd: Fwd: Fwd: Fwd: Fwd: Fwd: Fwd: Fwd: Fwd: Fwd: Fwd: Fwd: Christian relationships. sent all your questions to pastor's email : wisatkut_19@hotmail.com. Where is Jomtien Baptist Church? Is it inside the Baptist Conference Centre compound? (2) Exact location of gathering? (3) Name and contact email to the person leading/organising the gathering? Engish group always on Wed. 7.30 pm. I am a Christian, now staying here in Chonburi and Pattaya. The new one is wisatkul_19@hotmail.com. His yahoo's mail has more spam messages. May God blesses u to see someone to serve u in Christ. Fwd: Fwd: Fwd: Fwd: Fwd: Fwd: Fwd: Fwd: Fwd: Fwd: Fwd: Fwd: Fwd: Fwd: Fwd: Fwd: Fwd: Fwd: Fwd: Fwd: Fwd: Fwd: Fwd: Fwd: Fwd: Fwd: Fwd: Fwd: Fwd: Fwd: Christian relationships. Fwd: Fwd: Fwd: Fwd: Fwd: Fwd: Fwd: Fwd: Fwd: Fwd: Fwd: Fwd: Fwd: Fwd: Fwd: Fwd: Fwd: Fwd: Fwd: Fwd: Fwd: Fwd: Fwd: Fwd: Fwd: Fwd: Fwd: Fwd: Fwd: Christian relationships. Fwd: Fwd: Fwd: Fwd: Fwd: Fwd: Fwd: Fwd: Fwd: Fwd: Fwd: Fwd: Fwd: Fwd: Fwd: Fwd: Fwd: Fwd: Fwd: Fwd: Fwd: Fwd: Fwd: Fwd: Fwd: Fwd: Fwd: Fwd: Christian relationships. Fwd: Fwd: Fwd: Fwd: Fwd: Fwd: Fwd: Fwd: Fwd: Fwd: Fwd: Fwd: Fwd: Fwd: Fwd: Fwd: Fwd: Fwd: Fwd: Fwd: Fwd: Fwd: Fwd: Fwd: Fwd: Fwd: Fwd: Christian relationships. Re: Fwd: Fwd: Fwd: Fwd: Fwd: Fwd: Fwd: Fwd: Fwd: Fwd: Fwd: Fwd: Fwd: Fwd: Fwd: Fwd: Fwd: Fwd: Fwd: Fwd: Fwd: Fwd: Fwd: Fwd: Fwd: Christian relationships. Fwd: Fwd: Fwd: Fwd: Fwd: Fwd: Fwd: Fwd: Fwd: Fwd: Fwd: Fwd: Fwd: Fwd: Fwd: Fwd: Fwd: Fwd: Fwd: Fwd: Fwd: Fwd: Fwd: Fwd: Fwd: Fwd: Christian relationships. Thanks for finally deciding to reply. Scrolling down to the bottom of the (monologue) thread, my words still remain. As I do not have a Thai mobile number, but only UK and Swedish mobile numbers, I will communicate by email. Thank you. The email address tbc1971@truemail.co.th to Thailand Baptist Convention is dysfunctional due to: "Warning: undefined mail delivery mode: localdelivery (ignored). The users mailfolder is over the allowed quota (size). (#5.2.2)"
What is the email address to the so-called pastor of your Baptist church in Pattaya or Jomtien? Re: Fwd: Fwd: Fwd: Fwd: Fwd: Fwd: Fwd: Fwd: Fwd: Fwd: Fwd: Fwd: Fwd: Fwd: Fwd: Fwd: Fwd: Fwd: Fwd: Fwd: Fwd: Fwd: Fwd: Fwd: Christian relationships. And if u would to meeting someone at church. Pls. call Archan Nid ,pastor's wife who can help u.
Fwd: Fwd: Fwd: Fwd: Fwd: Fwd: Fwd: Fwd: Fwd: Fwd: Fwd: Fwd: Fwd: Fwd: Fwd: Fwd: Fwd: Fwd: Fwd: Fwd: Fwd: Fwd: Fwd: Fwd: Fwd: Christian relationships. Today, Thursday Feb.1 2018, between 17:40 to 17:45, I visited your office. While I visited your office, the office staff confirmed that the email address cccpattaya@gmail.com was read by the particular office staff to whom I was speaking. Upon my repeated (three times asked) question in your office, your office staff repeatedly confirmed that your office had never received any emails from Torsten Nenzen. With some life experience, I assessed that the body language, tone of voice, and behaviour of the particular office staff indicated that the office staff might not have answered truthfully. Can you please explain why the Baptist Conference Center did not reply to my repeated inquiry. 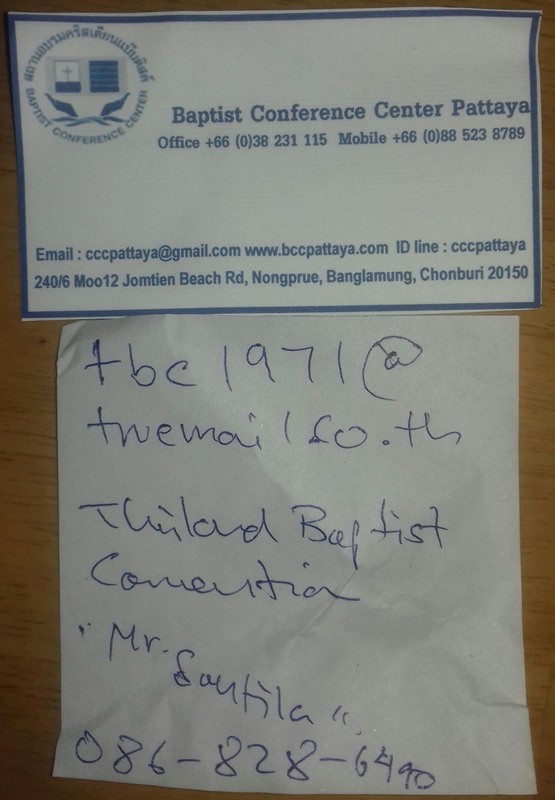 Email address to leader of Pattaya Baptist Conference Centre CHURCH ? What is the email address to the leader or leadership of the Baptist CHURCH at the Baptist Conference Center in Pattaya, Thailand? Please provide to me the name of their pastor and his/her email contact. Fwd: Fwd: Fwd: Fwd: Fwd: Fwd: Fwd: Fwd: Fwd: Fwd: Fwd: Fwd: Fwd: Fwd: Fwd: Fwd: Fwd: Fwd: Fwd: Fwd: Fwd: Fwd: Fwd: Fwd: Christian relationships. Fwd: Fwd: Fwd: Fwd: Fwd: Fwd: Fwd: Fwd: Fwd: Fwd: Fwd: Fwd: Fwd: Fwd: Fwd: Fwd: Fwd: Fwd: Fwd: Fwd: Fwd: Fwd: Fwd: Christian relationships. Fwd: Fwd: Fwd: Fwd: Fwd: Fwd: Fwd: Fwd: Fwd: Fwd: Fwd: Fwd: Fwd: Fwd: Fwd: Fwd: Fwd: Fwd: Fwd: Fwd: Fwd: Fwd: Christian relationships.